The University of Cincinnati Bearcats finished the college football regular season undefeated and #3 in the Bowl Championship Series (BCS) national rankings. The top three teams all boast undefeated records and all hail from BCS affiliated conferences (SEC, Big XII, Big East respectively). The win over Big East rival Pittsburgh on Saturday secured the Bearcats back-to-back Big East football championships, and their second straight BCS bowl game appearance. 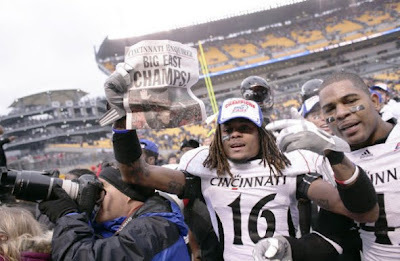 Last year the Bearcats struggled against Virginia Tech in the Orange Bowl and lost 20-7. This year the Bearcats will travel to New Orleans for the Sugar Bowl to take on the Tim Tebow-led Florida Gators who are coming off a crushing defeat in the SEC Championship Game to Alabama. Tim Tebow is arguably one of the greatest competitors in college football, and ended the game against Alabama crying on the sidelines. It will be a test to see if Florida comes ready and prepared for the Bearcats’ offensive onslaught, or if they’ll be disappointed about missing out on a chance to play for the National Championship which most people believed they would do from the beginning of the season until just now. The Gators have a terrific defense, but so far there really has not been a defense that has been able to slow down the Bearcats’ prolific offense led by Tony Pike and Mardy Gilyard. Instead the best defensive strategy has been to just keep the Bearcats offense off the field by running a slow paced offense that eats of game clock. Will Tim Tebow and company be able to keep the Tony Pike and company off the field? Will the Bearcats’ young defense be able to scheme for Tebow and the fast-strike Gators? Will Bearcats coach Brian Kelly still be around to coach in the game on January 1, or will there still be talks of him leaving acting as distractions? Will Urban Meyer and his coaching staff have similar problems as they entertain other coaching opportunities? In a nutshell, who will come ready to play? The game will be played on Friday, January 1 at 8:30pm in New Orleans. Bowl Central is the spot to get all the information on the game including tickets, travel accommodations, and game notes. This is the Bearcats second BCS bowl game appearance, and their first appearance at the Allstate Sugar Bowl. Next articleAre police force reductions needed in Cincinnati?